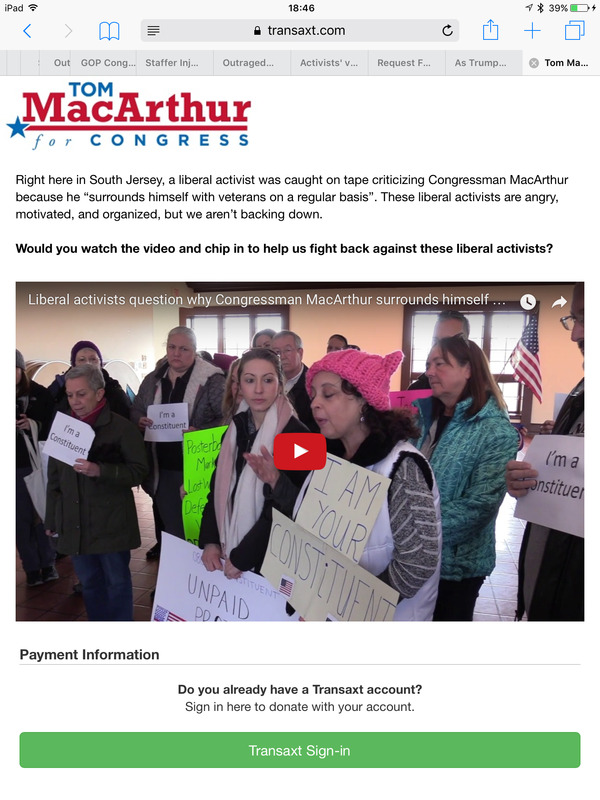 After telling their congressman, Tom MacArthur, that they are not “paid protesters,” constituents find highly edited versions of themselves in a fundraiser video. The fundraiser is officially promoted by the congressman and explicitly asks for help to “fight back against” them. “I like hearing divergent views, but I don’t want to be baited into having an event that some outside group can just make a spectacle out of,” MacArthur said, accusing protesters of being “bused in” or paid to cause disruption. In order to respond to this statement, about thirty constituents, most of them women, went to MacArthur’s Marlton office on the morning of Friday, February 17. They were greeted by Frank Luna, who serves as MacArthur’s District Chief of Staff. As described in the next section, the tweet refers to the staff member of a California Republican congressman, who sustained an injury that may have been contributed to by a member of Indivisible. Indivisible is a national group centered around resisting Trump and his agenda. 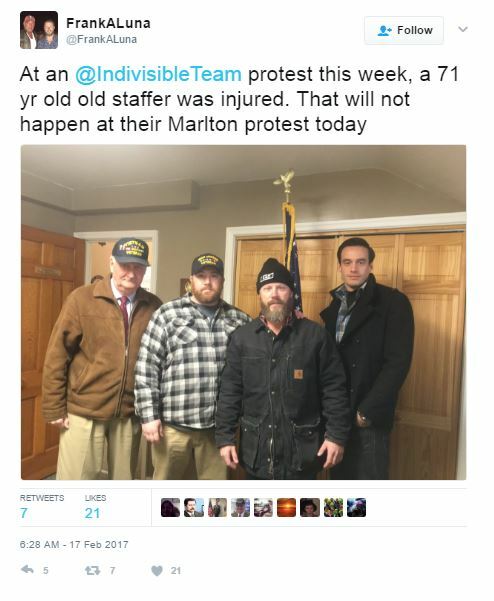 Local members of Indivisible: NJ 3rd District, some of whom would indeed attend that morning’s meeting, told me that Luna’s tweet felt like a warning directed towards them. On February 14th, members of Indivisible Orange County visited the office of California Republican representative Dana Rohrabacher. They were there to deliver Valentine’s Day cards as part of a larger effort to persuade the congressman to hold an in-person town hall. This is something that he and four of his Orange County peers had so far not done. They were met with a closed door, so they had a two-year-old girl slip one of the cards underneath it. Kathleen Staunton, a 71-year-old female staffer, unfortunately chose to open the door at the same moment, accidentally hitting the girl in the head. (According to her mother, the girl was startled but not hurt.) After seeing the crowd and its strong reaction, Staunton tried to close the door, but someone on the outside grabbed it and resisted. Staunton fell. She declined to be taken to the hospital by paramedics, but was later taken by a friend. The person pulling on the door may be somewhat responsible for the staffer’s injuries. Although likely, it is unclear if the person was a member of Indivisible, and there is no evidence of the mass unruliness or assault as suggested by Rohrabacher. In addition, the police made no arrests. Above is the full video of the meeting between Luna and the thirty constituents. The meeting was also covered on Blue Jersey, which presented a shorter video from a different angle. When asked for evidence to back up the congressman’s claim of “paid protesters,” Mr. Luna referred to two recent protests at the congressman’s offices that were allegedly organized by a paid staff member of a group called New Jersey Citizen Action, both of which he said were “widely covered” by publications including the Burlington County Times. After the meeting concluded, Luna stated that his original tweet was simply stating facts, and he emphasized that the meeting itself was “great” and that nothing inappropriate happened. The message of both the video and the fundraising plea are the exact opposite of what these people, his constituents, tried to express. After this experience, they have the extra fear that showing up to communicate with their congressman is now a gamble; one that may result in their very presence being used against them in public advertisements. While phrases such as “there are paid protesters from outside the district” and “a protester caused an injury” may be technically, narrowly true, MacArthur delivers them to an audience that sometimes uncritically interprets them to mean much more. These statements are officially promoted by the congressman, then nothing is done to refute them when they happen to be misinterpreted or exaggerated. Like many of his Republican colleagues, MacArthur seems to be using these as tools to actively pit one set of constituents against another, in an effort to suppress dissent. Next Post: Natural gas pollutes much more at the electric generation site than previously thought.